Vote for a Person, not a Party in the local elections on May 2nd 2019. Alastair Fear loves Abingdon and cares about local environment and community. The Children’s Centre was recently reopened and is now run by a charity called ‘Carousel’. 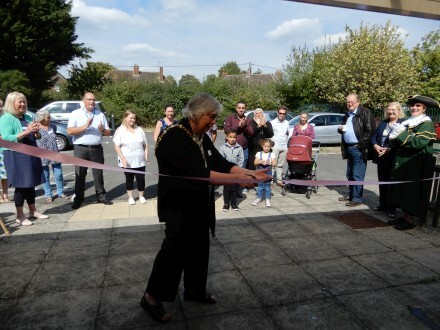 The Mayor of Abingdon, Councillor Margaret Crick, opened the centre. She is also one of the trustees of Carousel. There are baby clinics, parenting help, citizens advice and much more. For the latest information see the Caldecott Road notice board or www.abingdoncarousel.org.uk. 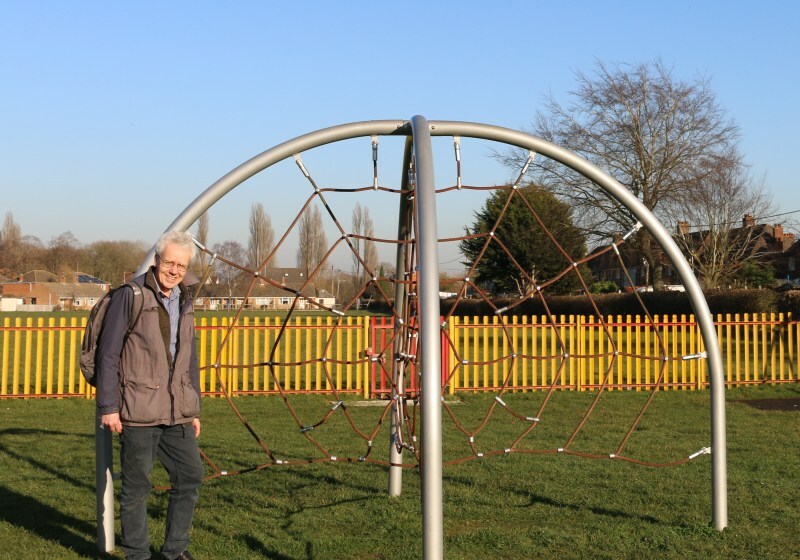 Well done to the current Town Council for helping to fund this work for three years. It is a great shame it was closed by County Council cuts in the first place. I will work to ensure that funding is sustainable. I have been canvassing on weekdays and Saturdays but take Sundays off, and this Sunday enjoyed some wonderful events in Abingdon. 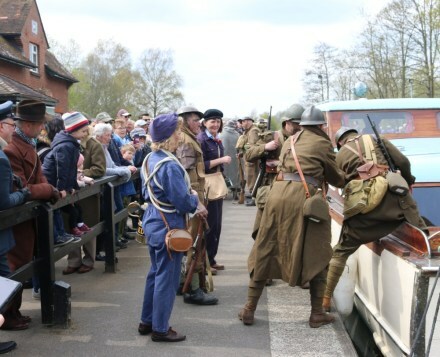 There was the WWII re-enactment at Abingdon Lock. A great event at a Great location. My Abingdon Blog has a report. There was the rowing in Head of the River with nearly 400 boats. 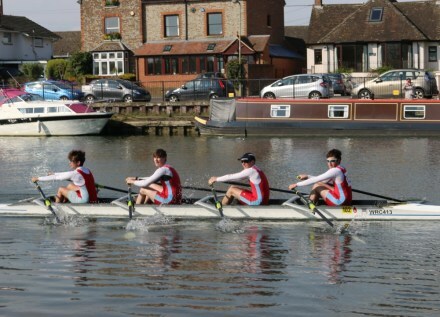 The event is organised by Abingdon Rowing Club, in Caldecott. There was also the fantastic cycling Festival. This ride pictured above is heading out along Wilsham Road in Caldecott. We do need to look again at the cycle way along Wilsham Road, with all the parked cars. I am trying to get round as many houses as I can to talk to people, but when it comes to sheltered housing and flats I am writing a letter instead to try to keep a personal touch. People have been very kind so far and I have had some very good questions, like a lady who has always voted Conservative but would consider voting for me as an Independent as she knows me. She asked whether, when the council is divided on a vote down party lines, I would vote with Lib-Dems or Conservatives. 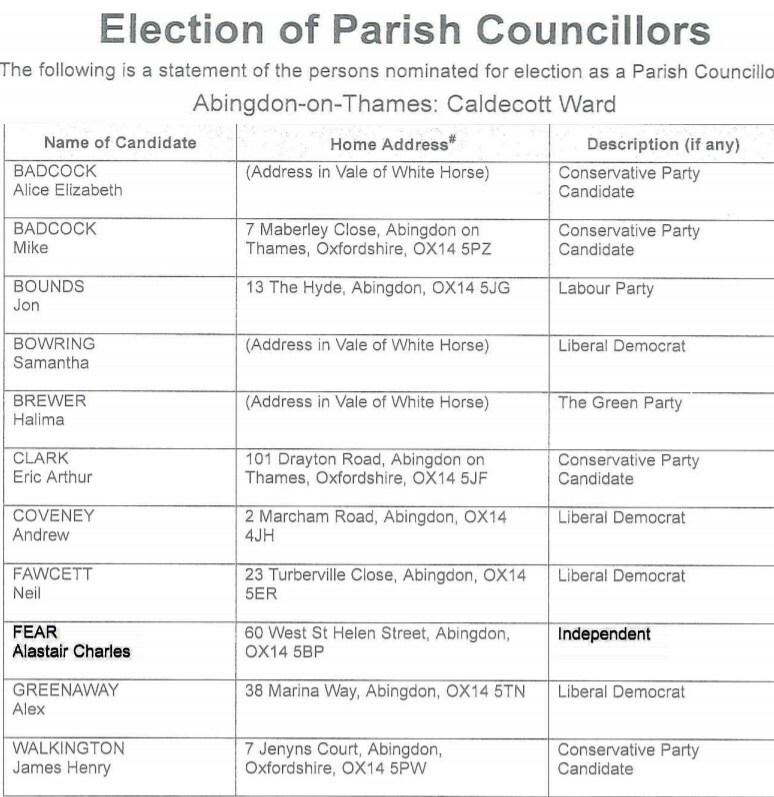 I said I would vote as an independent and for the best interested of Caldecott and Abingdon as I saw it. I have committed to being non party political. I am in favour of keeping good community services but think we must run things as efficiently as possible. Most of the town council money comes from council tax payers directly. I spent some time explaining to one young man about the different councils and what they do. A lot of the leaflets delivered by the parties assume a lot of prior knowledge. I went through one Conservative Party leaflet with him explaining the different responsibilities of Town and District Council. The candidates were standing for both so had blurred the responsibilities. I said in an ideal world there would be enough candidates so people would stand for one council and not both. Also that the three levels of council: County, District and Town was very confusing and need to be simplified for the sake of electors. A lot of people complain about the town council when it is the district or county responsible. On Caldecott Road the wood barriers on the grass are starting to fall to pieces. People driving to school to pick up children often park on the grass and those barriers were put there as a safety measure so people did not drive where children could be walking. It is still a mess after school time and the other verges get churned up. The traffic parked on Wilsham Road is a danger to cyclists, as are pot holes, and going through the chicanes on Preston Road. There are some people don't like canvassers. I tend to avoid knocking on the door if there is a notice. Some areas are very positive. Others less so. The Parties probably have a record of where they get a very negative response and can avoid that property but as I have no such records I just have to see what happens. The positives far outweigh the negatives. There is a “hustings” on the Abingdon Facebook group. The members of my group would like to ask the candidates the following questions. What changes - specifically and realistically – would you make during your term to make Abingdon an even better place to live? 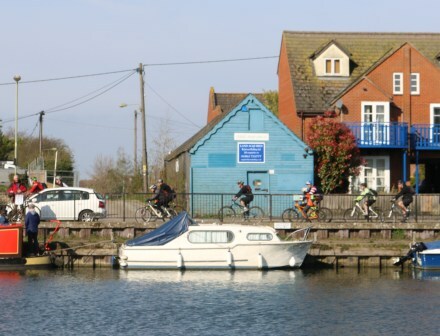 How will you improve the cycling and recycling facilities in and around Abingdon? Through the work of the OCSB, how will you ensure that school’s safeguarding and inclusion policies are written by independent experts and adhere to the guidance laid out in the Department for Education’s “Working Together To Safeguard Children” document? The electorate has received mixed messages over whether the Vale can afford to "forward-fund" their share of the Lodge Hill junction slip roads. Please could you tell us your view on the situation. How would you celebrate the contribution of LGBQT people to our community? 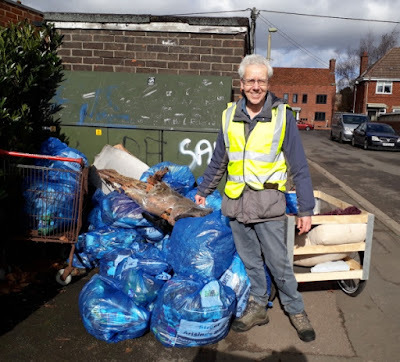 I am standing as a town councillor, not a district councillor, so will not have direct control over recycling. However my wife, and I, have given up plastic during Lent as we are not convinced plastic gets properly recycled and think it better not to produce waste in the first place. I would, as a Town Councillor, continue to promote Abingdon markets where you can buy without plastic, and promote Added Ingredients where you can get refills, and encourage any other such initiatives in other shops both as a councillor and through the Abingdon Blog (abingdonblog.co.uk) which I write. On Cycling I am committed to safer cycling and pedestrian routes from South Abingdon into town and would like to talk to cycle groups about how this can be achieved before putting forward a positive proposal. It has been tried before so we need something that will make a difference and work. Regarding school's safeguarding, I am a school governor, and am fully committed to safeguarding our children and giving them the best, and a safe, start in life. I will be running a Code Club at school and any matters that come to my attention will be raised with the school child protection officer. In community events, put on by the Town Council, I will use my training in this area to ensure safeguarding risks are kept in mind when planning events. I am not privy to information about Lodge Hill forward-funding. I strongly believe we need the infrastructure before the houses. The extra traffic from North Abingdon will have a knock on effect on Marcham Road and Drayton Road and make things worse for South Abingdon where traffic is already awful at times. My understanding is that the Highway Agency are considering the proposed plans but are probably not going to make a decision until they know what will happen with the Oxford Cambridge expressway. I celebrate all who take part in our community whatever their race, religion, or sexual orientation. I do not discriminate. I love to see community engagement and have always covered LGBQT events on the Abingdon Blog which I write. P.S See my wife's blog about about giving up plastic https://unfantasticplastic.home.blog/. I believe money has now been put into the Town Council budget for at least one new town centre notice board. This is one of the things I wanted to see happen, and will fully support if elected. I will use my allowance, if elected, to send out Caldecott newsletters to keep people informed, and keep this website updated about the Caldecott Ward. I would also like to find out whether there is a need for a local noticeboard. This was tried before by SARP (South Abingdon Residents Plan) and has not survived. There has been little new playground equipment in the Caldecott area over the last eight years. I would like to hear what young families would like in future. 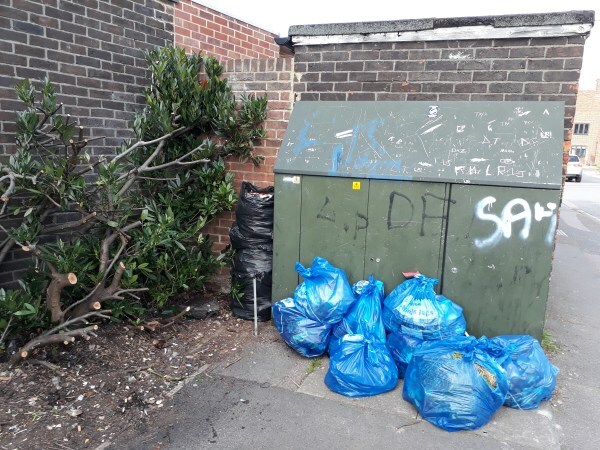 Abingdon Town Council look after Caldecott Rec. and River Close play area, and the Vale of White Horse District Council looks after Southern Town Parks and Tower Close. Caldecott is the base for a number of sports clubs and has a lot of green space, as well as access to the Ock and the Thames. I celebrate what it has to offer: Saxton Rovers and Abingdon Youth Football Club, Abingdon Rugby Club, Abingdon Rowing Club, Abingdon Sailing Club, Abingdon Tennis Club. 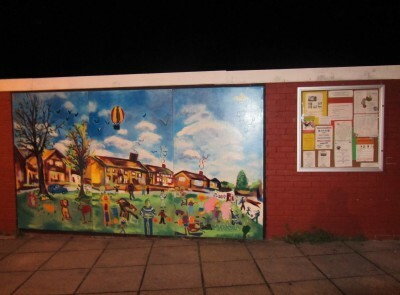 There are indoor Marshall Arts groups and Keep Fit and Dance at the primary schools and Preston Road Community Centre. It is a great shame that the army and district council did so little to support the Kingfisher Canoe Club when it was forced out of the area. I will support them in their search for a new home. Also I did try to establish a boxing club in the area, and am one of three trustees that look after funds raised for that purpose. We never reached the goal of the required £200K - having raised £23K. Those funds are still available and we will be looking again at what can be done to benefit young people in the area with sport's facilities. I am standing as an Independent for people who want to vote for a person rather than a party. I am up against 4 Lib-Dems, 4 Conservates, 1 Labour and 1 Green. Unfortunately not many Independents have stood in other places in Abingdon. There were quite a few considering it. 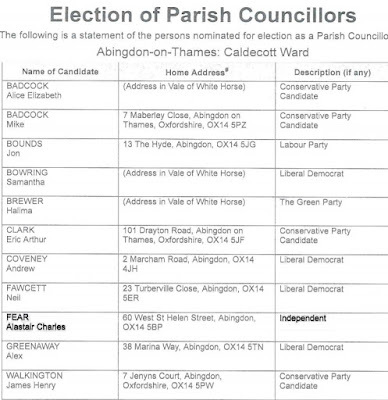 If I get in I will work with whoever is there for Caldecott, Abingdon. Flooding - Please look again! 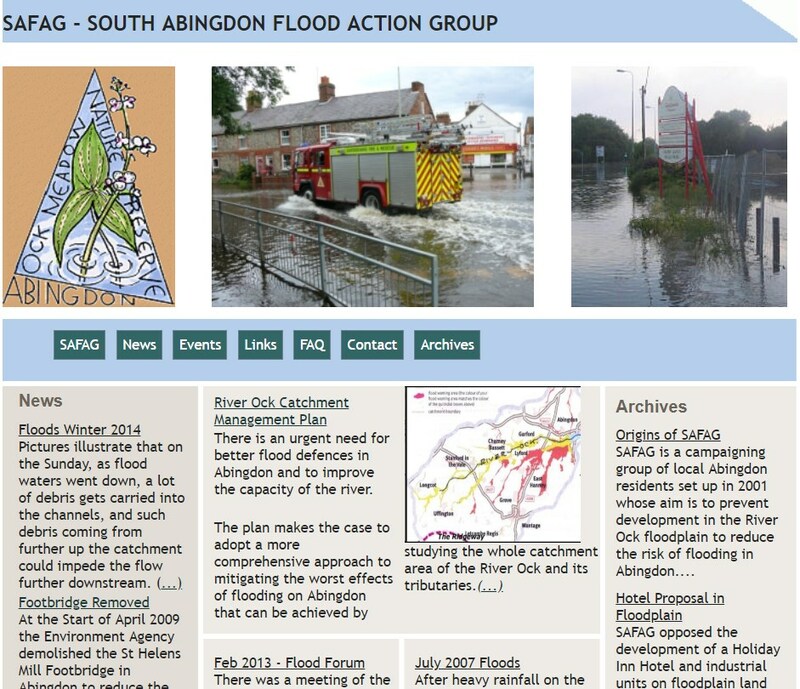 I looked after a website for the South Abingdon Flood Action Group which campaigned for better land management upstream on the River Ock to slow any floods. I am disappointed that the cost of the flood storage area west of the A34 has meant the project being postponed by the Environment Agency. I will campaign and work with others to ensure more funds, or another way, are found. Now the hedge is cut back, we returned to litter picking Reynold's Way yesterday. Somebody teased me later ... "I saw you doing your Community Service earlier Alastair." I will be delivering two leaflets during the campaign. There are 3,500 properties in Caldecott so that makes 7,000 recycled A4 sheets. I am doing litter picking, as a penance, to ensure the campaign is junk neutral. So far I have done two picks near Reynolds Way, one at Preston Road and one by Caldecott Road. On Caldecott Road, the mowers had made it worse by shredding and not clearing the rubbish. That creates more litter to pick up and takes longer. People have already raised that as a local issue. The state of the electricity cabinet in this picture could also be raised with whoever owns it. I can see no owner's tag but there is a high voltage warning. So I raised it on fix my street to see if that finds the owner. I will find ways if elected to improve the local environment. I help in litter picks in Abingdon and Caldecott but think removing litter traps and adding more bins will help more. Dog mess left on pavements is a problem in places and I would find ways to tackle that. I love the murals on the Reynold’s Way wall, and would like more art work in the area. I will explore people’s ideas for brightening up the area and tackling issues.